Over the weekend “Love and Hip Hop Atlanta” star, Momma Dee, found her self arrested for dining and dashing in Milwaukee. Momma Dee bail was set at $250 which she did post. According to reports Momma Dee was out dining with friends when she excused herself to the restroom the same time the waitress dropped off their check. Momma Dee claims once she returned to the table all her friends had vanished, leaving her with the $500 tab. She refused to pay for more than her meal but the restaurant was not trying to hear what Momma Dee had to say. Police were called and she was hauled to jail. 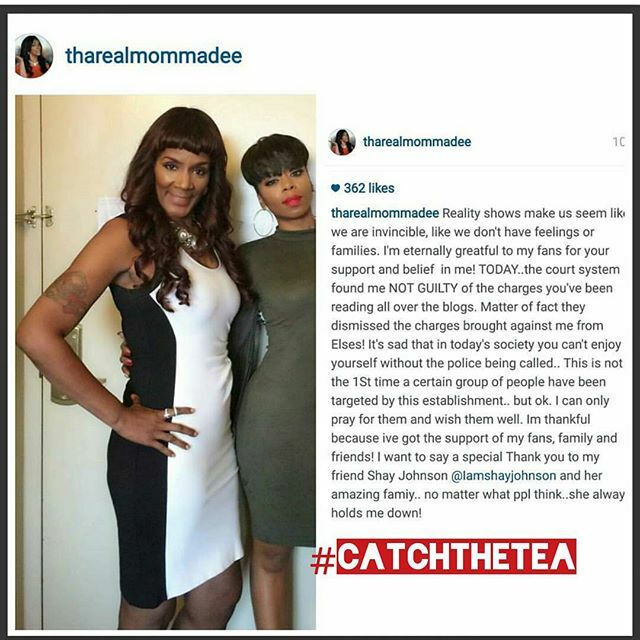 This morning Momma Dee updated fans on her charges, saying they were all dropped.